The Fell Township development is our northern-most development in the County. 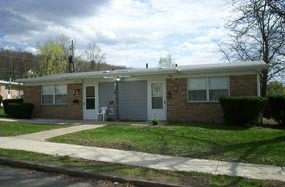 Located just before the City of Carbondale, in Simpson, it is a quiet and small site. This is an ideal site for someone who is from the area around Carbondale or wants to get away from the busier sections of the County. The streets within the site are Obzud, Railroad, and Rittenhouse Place. Although it is a little further out, it still has access to retail areas and medical facilities. There is public transportation to anywhere in the County and a pickup point for that transportation only one (1) block away from the site. The site is for both elderly or families. The development office is on Railroad Ave. The phone number for the site is: (570)282-3390. For more information on applying for this site or an application. Visit our Application Page on this web site.